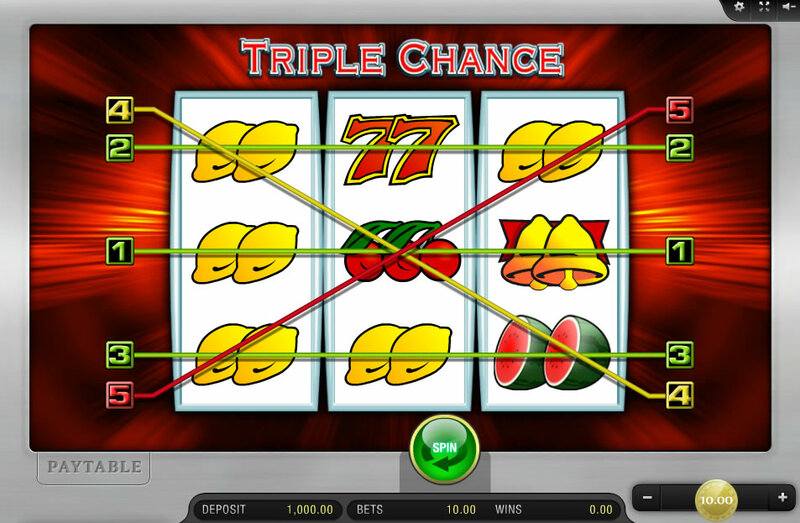 The Triple Chance slot game’s original version was first created years ago by the world famous German provider of entertainment games known as Merkur. 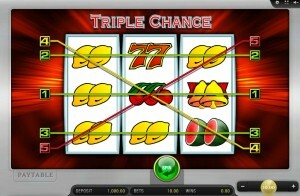 This classic fruit machine is a basic slot that is exceptionally easy to learn due to its user friendly design. Initially, it was strictly offered at land-based casinos. Due to its tremendous popularity, it was one of the first of Merkur’s games to be launched online. The first online version used the land-based game as a model. However, the graphics were nicer on the online version, and it also had additional features. The popularity of the online version grew quickly. 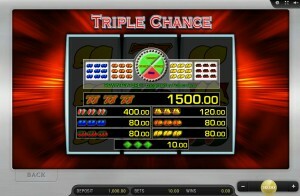 As a result, Merkur soon launched another online version called Double Triple Chance. The game play and the features of the three online versions are basically the same except for the Re Win Bonus feature. Being a classic fruit slot, its symbols are what you would expect such as the classic fruit including plums, cherries, oranges, and lemons. Besides the fruit symbols, it also has bells, diamonds and 7s. The rules do not provide for special symbols nor free symbols. 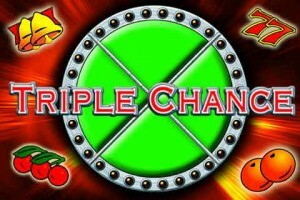 All versions of Triple Chance have 3 reels and 5 fixed paylines. They are, of course, all fruit machines and the gameplay is basically the same. 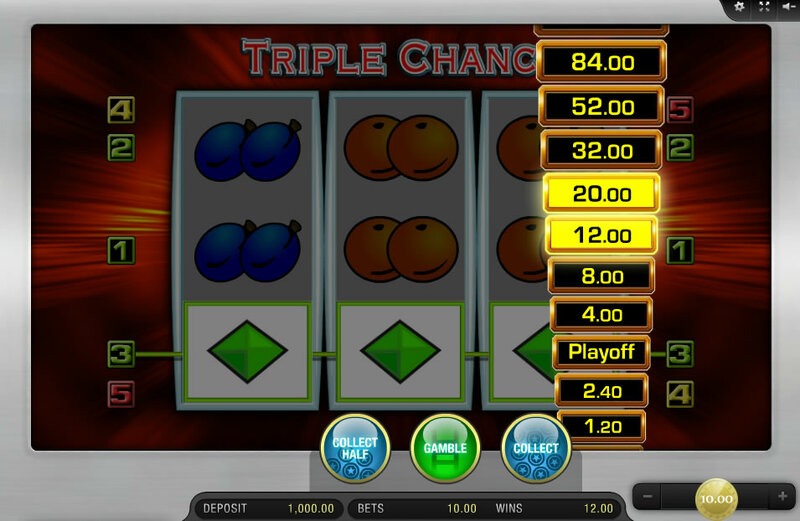 The goal of the game is to get a combination of 3 identical symbols to appear directly next to one another on the same payline across all three reels from left to right for a win. The bet per spin is chosen by the player who can at any time adjust the bet per line. The Maxbet option automatically plays with the maximum bet level. The player always knows what bet they are playing with because it is always visible on the screen. Unlike many fruit machine games, there isn’t a Scatter or Wild symbol. It also doesn’t offer either the “nudge” or “hold” option causing players not being able to manipulate spin results. The Gamble feature does, however, allow players’ skills to have a role with the “Gamble Ladder” game. With the game’s auto start feature, the selected number of spins plays automatically. The Gamble Option: After a winning spin, the Gamble option is randomly triggered. On the screen the “Gamble Ladder” button and the “Gamble Card” button appear. The player then chooses one of the two. If you click on the Gamble Card button, you are given the opportunity to double your winnings. If you guess the color, red or black, of the next card drawn from a virtual deck correctly, you double your winnings. You can continue playing the Gamble Card up to a certain limit or until you hit no-win gamble. You can also choose to bet all of your winnings or only half of them. Gamble Ladder Option: If you choose the Gamble Ladder, a stack of blinking bars appear. A way you can try to increase your winnings is to click on the Gamble button when the step with a higher winning value blinks. If you click on “collect”, you can skip the Gamble game and continue to play the regular game. 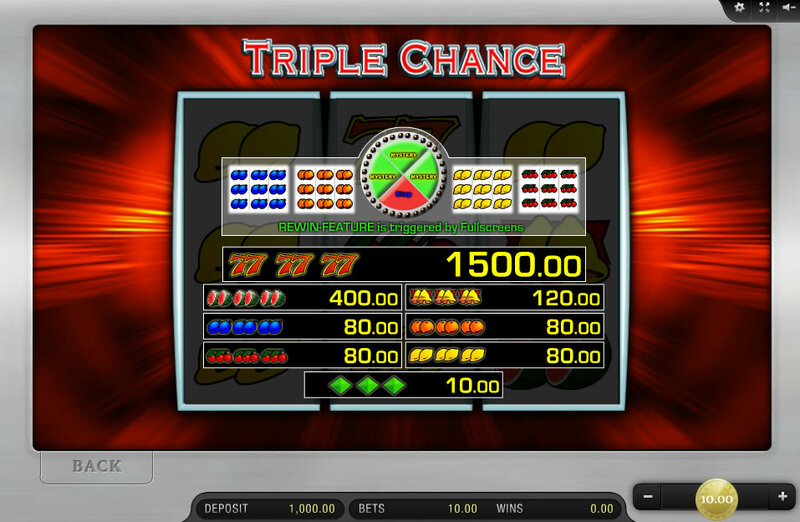 Re Win Feature of Triple Chance Game: When 9 identical symbols appear on the reels, the Re Win feature is initiated, and the whole screen is covered with that same symbol. A Re Win wheel that is divided into 4 sections then appears on the screen. The wheel has a stop sign in one section and the other 3 sections have a mystery sign. If the wheel stops on the stop sign, you win nothing and the game is over. If the wheel stops on any of the mystery sections, whether you double your winnings or win nothing is determined by what lays behind the mystery sign the wheel stopped at. Until a “no win” is hit by a spin, the spinning of the wheel will continue. Triple Chance has been a favorite slot game for many players who especially enjoy classic fruit machines for years. The familiarity of this game and its 3 reels and 5 paylines is what many players love. A fantastic playing experience that includes advanced bonus features and great payout options are what makes this game perfect for the beginner or anyone who seeks a classic online slots game.